Many broadband users usually buy ZTE modems with internet data packages from various network operators such as T-mobile, Three, Orange and Verizon for connecting to the internet. However, most of the mobile network companies lock their modems to avoid using with another network companies. Therefore, most of the people need to unlock their modems for using with other networks. In this article, I will discuss about unlocking ZTE HSDPA modems. Here, I used dccrap in this unlocking process so that before you connect the modem to the USB, you need to put an invalid operator SIM Card. Hence, the software can identify your modem for unlocking. Let's see how to do this process step by step. You can get unlocking software from the below links. Choose ZTE datacards in a select manufacture option and then press the search button below. Hence, it will detect the modem and display the details of the modem. Now, you can click Unlock button for unlocking the modem. While i was taking these screen shots, i don't have a modem for unlocking. So, you will see that the unlock button is disabled in the below screen shot. But, in actual case, unlock button will be enabled for unlocking. I have a dead K3772-Z modem correctly displayed by Windows 7 Device Manager as "Vodafone Mobile Broadband Modem (ZTE)", but it is not detected by any software, including its original Vodafone Mobile Broadband, DC-Unlocker etc. So, I probably have to reflash the modem with a new firmware, but didn't find any such file on the internet (including ZTE's website). Now, when connected to the PC via USB, the modem flashes red. Excellent guide on unlocking a ZTE 998 in the similar way, I unlocked my ZTE 998 from Vodafone using unlock code. I got the unlock code for my mobile from Unlock ZTE 998 affordable cost with easy unlocking guide.
. Here i got unlock code then unlocked my zte modem easily. guys I've added you guys to our blogroll. do i need any special software for the unlocking? You can download the software from the given URL. Didn't the device recognize by the software? 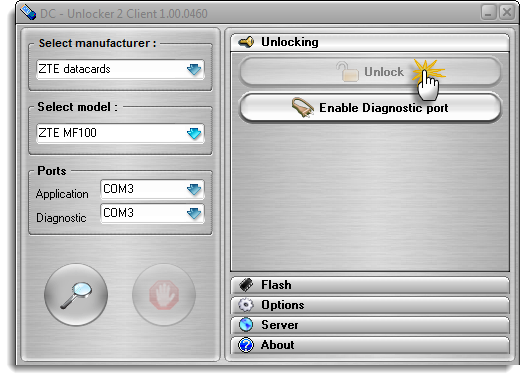 While detecting it shows unknown modem... just gave unlock modem command, and it will work. Worked like a charm on a ZTE MF620, locked to TMN in Portugal. Thanks a lot! Worked like a charm on a ZTE MF620. Thanks a lot!